The last few weeks had me occupied with a complete master bath remodel. We "hired" it done, but there were still enough peripheral chores to keep me out of the studio, and in construction mode. I did manage to squeeze in three small paintings during what little free time I could find. 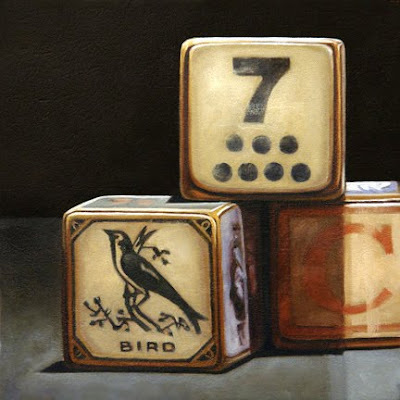 Anne Irwin asked if I could provide a few paintings for her upcoming Small Works show in December. 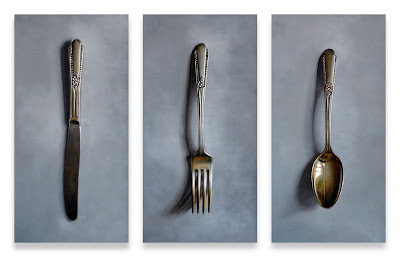 I was pretty excited about the photography I had done of the silverware Karen's parents had brought over, so decided to try a triptych. Now I'm back at work painting for Stricoff Fine Art. I'm hoping they will like what I'm doing enough to send them out to the west coast for the Los Angeles Art Show in January. 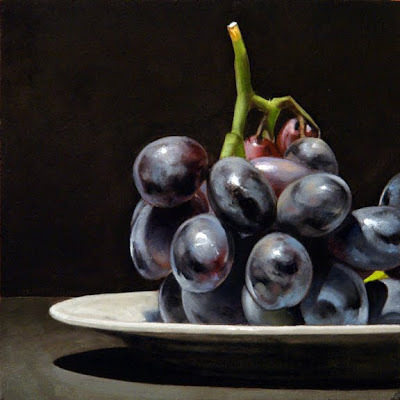 It's funny how one of the most common themes in still life paintings, down through the ages, has been the grape, and yet I have never painted them. I'm not sure why. Plenty of other fruits, and lots of cherries, but no grapes. When I recently came across these beautiful black grapes at COSTCO, I knew I would have to give them a try. Those wonderful frosty blues, and hints of alizarin crimson were irresistible. Can't wait to do another. If you'd like to bid on this painting, you can participate in the auction by clicking here. One of the new subjects explored in my recent photography sessions, was saltine crackers. In and out of their translucent wrappers. I paired them here with a glass of milk. 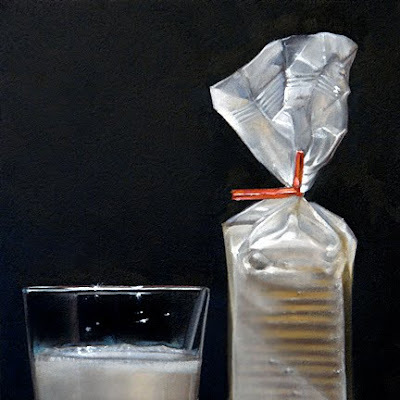 Back in the old days when I still consumed white flour, I loved to eat saltines, and wash them down with a glass of milk. Now that's a faded memory, but I still think they go together pretty well in a painting. If you'd like to bid on this painting, you can take part in the auction by clicking here. 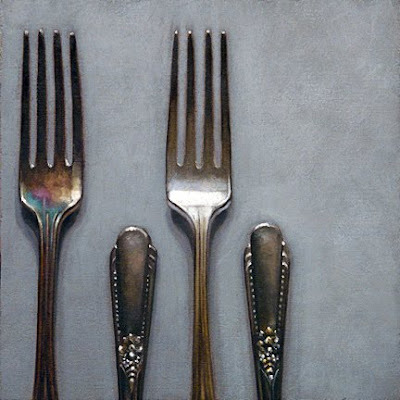 One day during my recent week of photography, Karen's parents came by, and brought a box filled with old silverware. Thought we may like to have it. I spilled the box out on the kitchen table, then sorted them out to find the most photogenic pieces. I was looking for a new spoon to go with a coffee cup composition. When I saw the pieces laying there, I really liked how they looked all lined up, so I started taking pictures of them in various configurations. This is the first of hopefully many of these paintings. If you'd like to bid on this painting, you can take part in the auction by clicking here. Another day of remodeling. It's kind of strange having other craftsmen working on our home other than me. I spent most of my free time during the first eight years we lived here doing all the remodeling myself. A leak in our master bath was the impetuous for this remodel, and with both of us painting full time, it was necessary to go to a contractor for this job. I have to say, it's wonderful experience watching people at work who really know their job. The tile guys came today, and it's been a joy to watch these artisans practice their craft. They began at nine this morning, and are still at it as I write this post (8:00 p.m.), and the room looks so good. Karen is really happy to finally have the bath she's waited for for so long. Getting back to some art of my own, tonight it's blocks. I've gotten so much positive response from this subject that I've decided to do another. Which is fine with me, because they are fun to paint. If you'd like to take part in the auction of this painting you bid by clicking here. I've been going in ten different directions for the last week or so. Karen and I are remodeling our bathroom, so we've been dealing with contractors, craftsmen, and its' subsequent disruption of our daily routine. Plus I've been helping Karen get ready for her December show at Dean Day Gallery in Houston. In the small breaks peppered through all of this, I've also been working to get some new paintings out there. 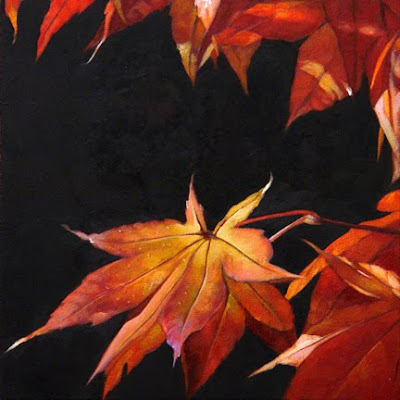 The maple leaves above will be the first of five ebay paintings scheduled to be listed this week. I've also been working on three new paintings for Anne Irwin's "Small Works" show, also scheduled for the first week of December. 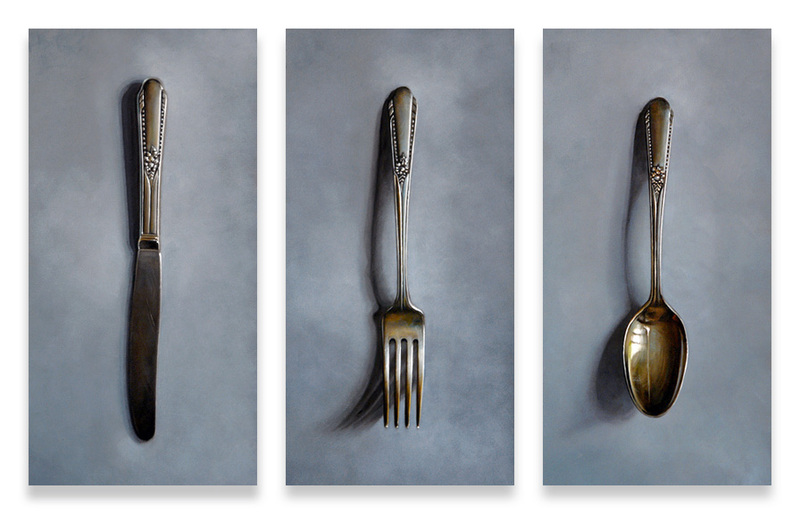 Once all of these are complete, I'll be getting back to some larger pieces planned for Stricoff Fine Art. They send work to the L.A. Art Show each year, and they mentioned that they would like to send a couple of pieces from me, so I really need to get going. If you'd like to bid on the painting above, you can access the auction by clicking here. p.s. I joined FaceBook this week, and I have to say that it's been a very warm experience, and a great place to find, and network with other artists.